You know I'm a fan of systems. Mainly that's because I can follow some strict rules and the system can make betting decisions for me. Most of the systems I create can be automated by a racing database and once I've created them then the selections are just sent to me each day. But I'm aware that I could probably be making more money if I used systems that were not created from data that is available to everybody. In the old days I would spend hours, days even weeks back checking a system idea with my old copies of the Racing Post or Sporting Life. And in some ways winning was easier then, because by putting in the hours with old papers I was doing something that was too much effort for many punters. And that is always the way. If you put in more work, or if you use data that is not available to the betting public then you are more likely to win because you can exploit an angle that is not being used by the majority of bettors. Another way to create winning systems is from years of experience and record keeping of winning bets. Analysing past records can show you where your profit comes from and allow you to simplify the selection method and boil it down into a winning system. There will always be more profit in a system like this because it is bloody hard and relies on the initial skill to select winners and on the patience to analyse years of real bets. 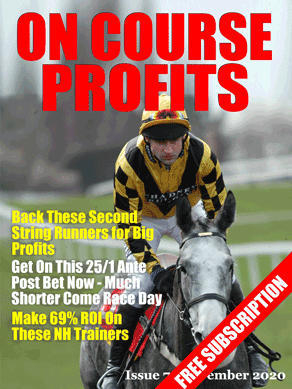 I've just read a very interesting article in this months Secret Betting Club newsletter. The article looks at fluctuations in the winning percentages of various football bets and at how these fluctuations might have effected your betting. And probably more importantly how you might feel about your betting method and how your decisions about strategies may have been impacted. For example, you could have backed every home team priced below 1.9 so far this season and made a nice profit of 25.73 points and a return on investment of 8.22%. This is from betting in English Premiership, Championship, League One, League Two, Conference and Scottish Premiership. That's the good news, the bad news is that only one other year has shown a profit since 2005 and that particular year made a 0.03% return on investment. And it's likely that the same strategy would not make a profit again next year. But if you just started this year betting teams that fall into this category, this season, you would likely think you were onto a winning method. Especially of the results continued to the end of the season and ended in profit. Nest season you might be excited to get started and be prepared to bet at larger stakes in order to increase your profits. Only to meet a losing year. This article is 7 pages of detailed info with lots of interesting points, skipping ahead now to another interesting point that caught my eye. That is how few matches have to go against you to turn a winning year into a losing year. You can see that if you are betting at odds of 2.0 that for every 100 bets if 55 win you will make a 10%, but if only 45 win you will make a 10% loss. What's interesting is that when you move up to odds of 5.0, just 2 bets going for you or against you can make a huge difference. Looking at the 5% profit column we can see that at 5.0 that 21 wins out of 100 will give us a 5% profit, but if that drops down to 19 wins we lose 5%.